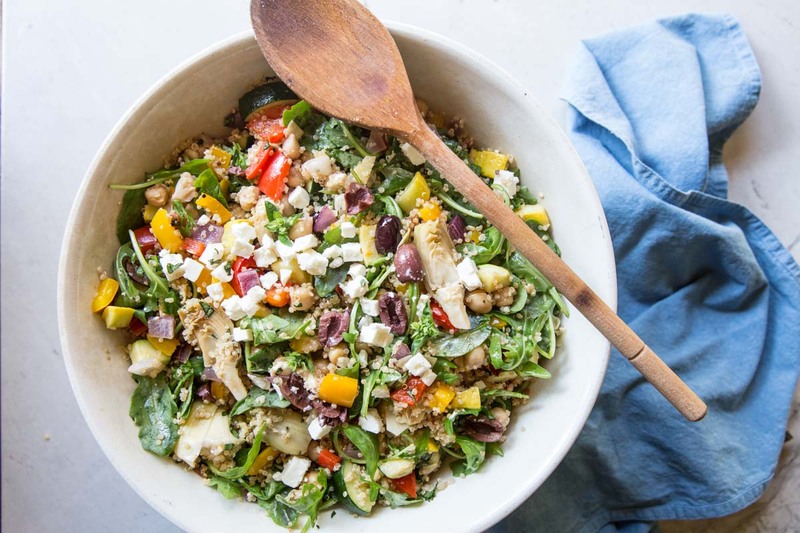 This Mediterranean Quinoa Salad Recipe is perfect for a party side dish or for making on Sunday to enjoy as a healthy weekday lunch. 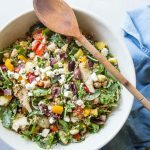 The most common answer to the question I often ask my husband, “Is there anything you’d like for me to make this week?” is, “A giant quinoa salad.” Sound strange?… it certainly does to me too!! He’s a candy and chip loving Southerner who could out eat just about anyone in meat or potatoes but when it comes down to what his body craves… this quinoa salad is it! 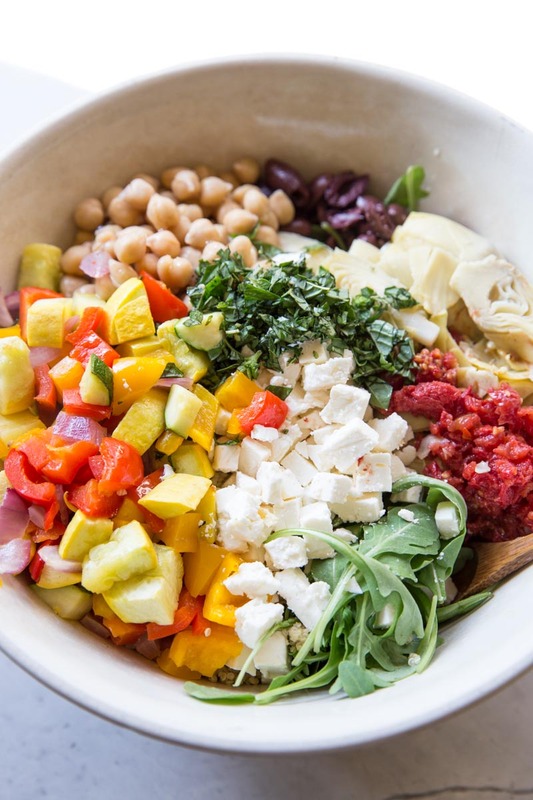 For the rest of us in the family, if we can get a bowl or two to ourselves, we also enjoy this salad. I love it for lunches if I make it at the beginning of the week or to bring to gatherings, since it makes such a huge portion. Most recently I made a big catch for Josh as me and the kids were going to be out of town for a week (and he requested it) but I also brought some for a good travel day lunch. It was a perfect airplane lunch along with a bar and some ginger ale. • I like to roast my veggies (bell peppers, red onion and zucchini) in this salad but if you prefer them unfrosted or just want to skip that step feel free to do so. • For the feta I always use a block of feta (those have the best flavor and texture in comparison to the feta crumbles. I roughly chop up 2 ounces of the block and stir in 3/4 of the cheese then top the salad with the remaining. • If you don’t have fresh basil, feel free to use 2 teaspoons of dried as a replacement. 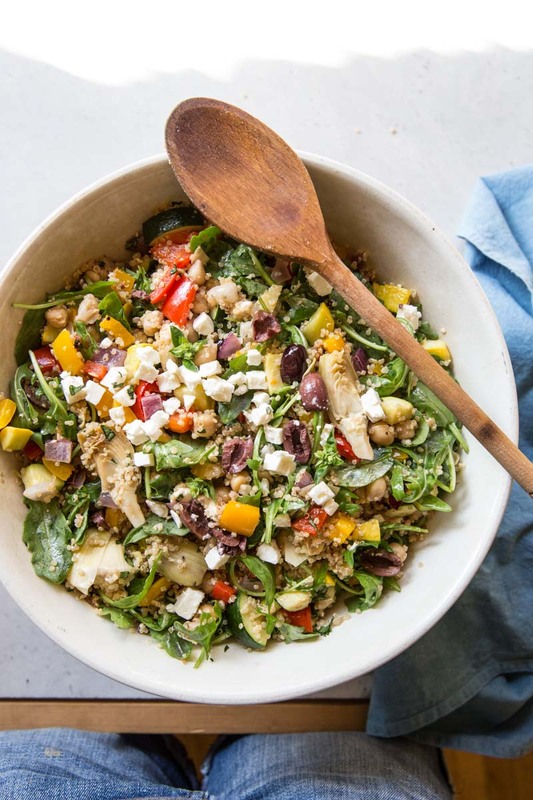 This flavorful Mediterranean Quinoa Salad is loaded with veggies and makes a huge batch so you have plenty for lunches or snacks all week. Preheat the oven to 400 degrees and line a baking sheet with foil. In a medium sauce pan combine the cup of quinoa with two cups of water and bring to a boil. Turn down to a simmer then cover and set a timer for 15 minutes. Check for doneness after 15 minutes then fluff with a fork and set aside to cool. In a large bowl combine the chopped bell pepper, red onion, squash, and zucchini. All of these should be chopped in 1/2 inch cubes. Add in 1/2 tablespoon of olive oil and 1/4 teaspoon salt. Stir to combine then transfer the veggies to the prepared baking sheet. Roast veggies for 12-15 minutes or until starting to brown yet still slightly crunchy. 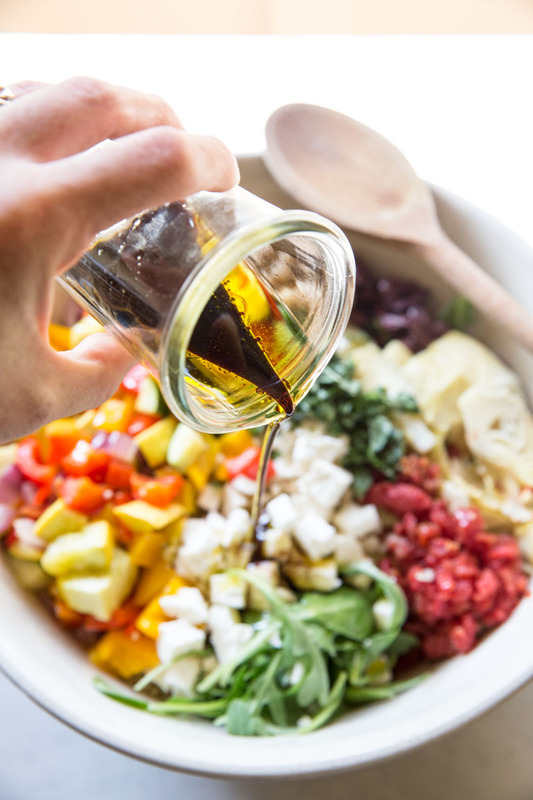 While veggies are roasting, finish chopping the rest of the ingredients or mix up the dressing (1/3 cup oil, 3 tablespoons balsamic, 1/2 teaspoon salt, 8 grinds of pepper, and 2 tablespoons basil). 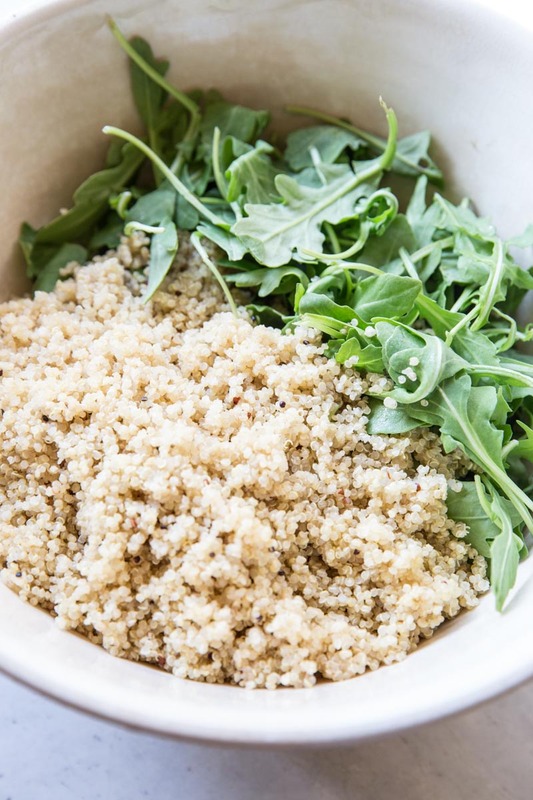 In the same large bowl used previously for the veggies, start combining ingredients starting with the quinoa and arugula. Stir in everything then add in the dressing. Toss to combine. Store in an air tight container in the fridge. This will keep for 5-6 days.